This special edition, guest edited by Nontsasa Nako from the University of Johannesburg, addresses the issue of decolonizing prisons by confronting both the day-to-day function of the prison and also wider impact of imprisonment on various communities in South Africa. Thato Masiangoako examines the frames of rationalisation employed by migrants and student and community activists, who were victims of police violence due to their perceived activist or migrant status. Her article helps us understand how enduring cultural, social and institutional histories shape popular perceptions and may account for ‘the enduring nature of prison’, despite their experiences of unfair detention. Palesa Madi and Lubabalo Mabhenxa show how the insistence on verification of address in bail hearings makes it difficult for the poor and marginalised to be released on bail in South Africa, where it is not uncommon for people to lack fixed homes. The authors conclude that with the remand detainee population so high in South African prisons, the human rights instruments should be utilised to bring South Africa in line with international human rights law. 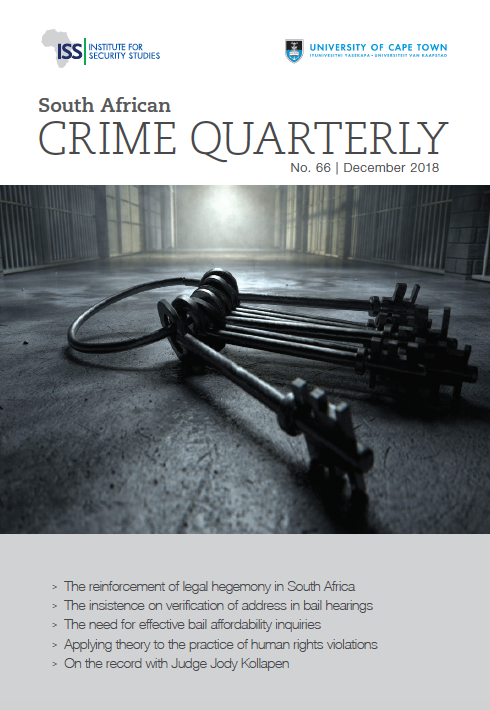 Untalimile Crystal Mokoena and Emma Charlene Lubaale argue that through bail, or verification of address as a condition for granting bail, remand conditions, as they stand, create unequal access to justice. These authors argue that bail affordability is a paramount consideration if we want to ensure that there is equality before the law and that the dignity of the indigent accused is protected. Anthony Kaziboni’s piece on the Lindela Reparation Centre uncovers the crude manipulation of social problems and abuses at the Centre. Drawing on Giorgio Agamben’s concept of ‘bare life’ described in Homo sacer: sovereign power and bare life, Kaziboni follows media reports on Lindela over a period of 18 years to identify what he terms ‘xenophobic biopower’, wherein immigrants detained at the centre are presented as negatives in South Africa. He argues that when the detained immigrants are constituted as exceptional, and when their rights are suspended due to ‘illegality’, all manner of violence against them is permissible. Judge Jody Kollapen suggests in ‘On the Record’, that decolonisation is a broad concept, and the high rate of crime places undue focus on crime and punishment rather than on the various factors that produce social malaise. The papers in this volume help in expanding our knowledge and might ultimately guide us towards the decolonisation of institutions such as prisons. This issue was made possible by funding from the National Institute for the Humanities and Social Sciences Working Group Fund.